Southern Californiaâs version of a coastal brownstone manor, this stately property strikes an iconic presence from a rare corner lot location. With single story Robinson elementary across the way, this particular NW corner lot is situated to offer more open space than most others do; a rarity in the densely populated Sand Section. Ideally located within walking distance of Downtown and the beach. 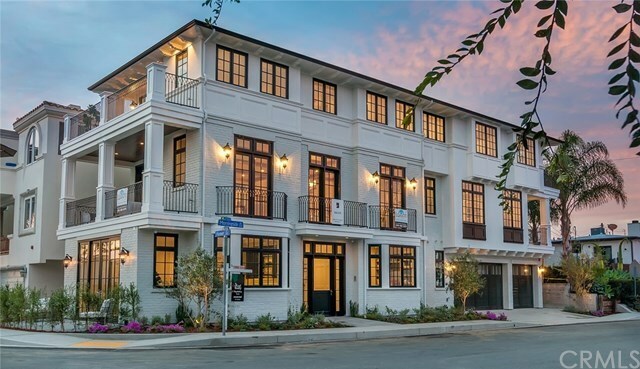 Developed by Balios Capital and expertly built by LuAnn Development, this brand new luxury residence is flooded with natural light while capturing ocean views as well as views of the Peninsula beyond. Designer window treatments, zoned AC, and a complete Sonos AV system are installed throughout; including TV's and built-in speakers. A tremendous amount of consideration has gone into the design of this unique property, fitting it with the finest details and materials that invite a new owner to move in without having to invest further into luxury amenities. The entry level features a large entertainment room with a built-in bar, a guest suite, home office, mud room and three-car garage. The 2nd level showcases high ceilings, a great room with fireplace, a gourmet kitchen with built in dining nook, top of the line Wolf and Sub-Zero appliances and two decks that extend the living spaces outside by way of accordion doors. The top floor offers a total of 4 bedrooms. An exquisite master suite features an open balcony with ocean views, a massive walk-in closet and spa-like master bath.